The lighthouse when originally constructed, presented an entirely different appearance from what it does at the present time. It was not so high as the existing structure, it sloped much more rapidly towards the top, and was surmounted by an octagonal lantern with eight heavy glass windows. A stone staircase with an iron balustrade led to the second storey, where an iron gallery surrounded the whole building. The alteration to the present form was made in the early part of the nineteenth century. 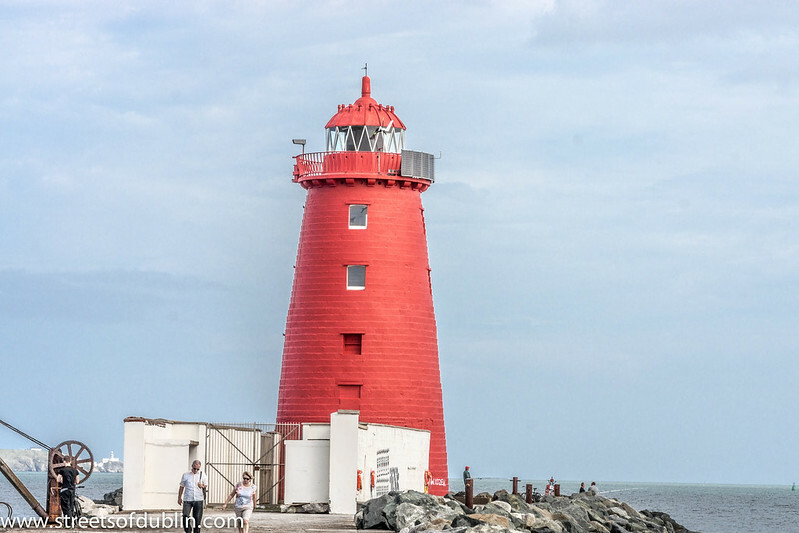 The lighthouse, one of a formation of three, is located on the Great South Wall (South Bull Wall), at the Port of Dublin, which extends from Ringsend nearly four miles out into Dublin Bay. The wall was the world’s longest at the time of its building, and remains one of the longest sea-walls in Europe. One of the other two lighthouses is located on the Bull Wall opposite, and the other on a wooden platform mid-channel. The Poolbeg Lighthouse is painted red. The green lighthouse in Dublin bay is the North Bull lighthouse, a couple of yards off the end of the North Bull Wall, and another lighthouse sits out in the bay itself. Green is for starboard (right) and red is for port (left) – presumably its right and left as you enter Dublin port (travelling from east to west) so the north would be on your right/starboard and is therefore green and the south would be on your left/port and is therefore red. The lighthouse, automated for many years, is managed by Dublin Port Company, whereas most lighthouses in Ireland (Northern Ireland and the Republic Of Ireland) are managed by the Commissioners of Irish Lights. Image published by infomatique on 2012-09-06 19:40:36 and used under Creative Commons license.